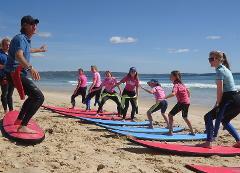 Group surf lessons are held at Pambula Beach over summer and some school holidays. Exceptional coaching is provided by qualified friendly surf instructors and all lessons include surf boards, steamer wetsuits and leg ropes. Group surf lessons are available over summer and some school holidays. Exceptional coaching is provided by qualified friendly surf instructors and all lessons include surf boards, steamer wetsuits and leg ropes. This is a 3 x 2 hour lesson package designed to progressively improve your surfing ability. The 3 lessons need to be completed over a 5 day period. 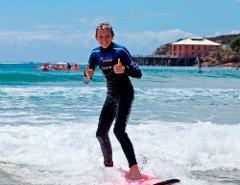 Lessons are offered everyday at Pambula Beach and three days per week at Tathra Beach. Enjoy a one on one surf lesson with a qualified instructor or share the time with a group of family or friends. Surf lessons are held on some public holidays throughout the year at Pambula Beach. Exceptional coaching is provided by qualified friendly surf instructors and all lessons include surf boards, steamer wetsuits and leg ropes. 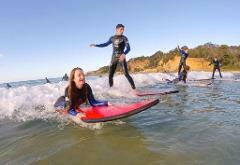 Surf lessons are available on some public holidays throughout the year at Tathra Beach. Exceptional coaching is provided by qualified friendly surf instructors and all lessons include surf boards, steamer wetsuits and leg ropes.